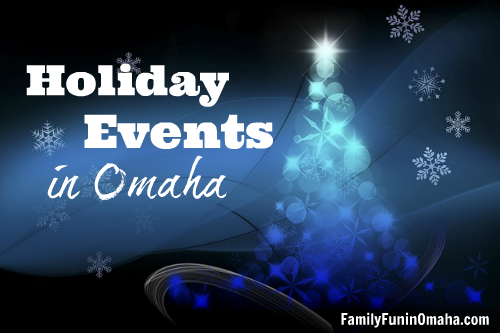 100+ Family-Friendly Holiday Events in Omaha! 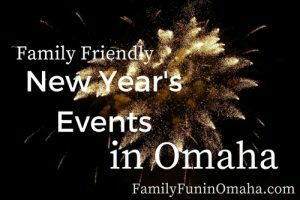 Enjoy many Family-Friendly Events this Holiday season in Omaha including Family Fun Days, Holiday Celebrations, Santa Visits, Christmas Lights, and more! Check back as more events will be added throughout the season. It is always a good idea to verify the information with the business before visiting as details and times may change. 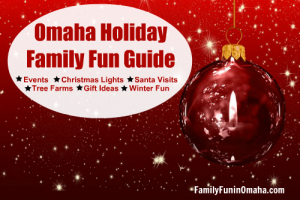 See more Holiday Fun in our Omaha Holiday Fun Guide! It is always a good idea to verify the information with the business before visiting as details and times may change. Location: Bass Pro Shops, 2901 Bass Pro Dr, Council Bluffs, Iowa. FREE Photos and Crafts. A different craft each week and giveaways to the first 100 kids Monday-Thursday beginning at 5 p.m. Experience one of Omaha’s favorite holiday traditions. Location: 3215 State St., Omaha. The center closes at 3 p.m. on Thanksgiving Eve, Christmas Eve, and New Year’s Eve. The center will be closed on Thanksgiving Day and Christmas Day. The 2018 theme is “Family: A Glimpse of Heaven.” Verify before visiting for early closings/closing for Holidays. Location: 222 E. Broadway, Council Bluffs, IA. Enjoy a wonderful collection of 20 window displays created by local nonprofits, students and individual artists, and vote for your favorite. Location: Midtown Crossing, 35th & Farnam, Omaha. Celebrate the spirit of the holidays with a full season of festive, family-friendly activities, plus enjoy more than 40 blocks of beautiful lights in Downtown Omaha. Shine the Light on Hunger invites visitors to donate non-perishable food at the ice skating rink and other locations throughout the festival. Capitol District Ice Skating Rink – Open Friday, December 7, 2018 through Monday, January 21, 2019. $10 admission fee includes skate rental and benefits Food Bank for the Heartland. Santa’s Magic is an interactive show with indoor snowfall and delightful characters like the Snow Queen and, of course, Santa, who arrives by climbing down the chimney. At the end of each show, children will be able to talk one-on-one with Santa and get their picture taken with him (photo packages available for purchase). Multiple shows will be held daily and are included with museum admission. Location: The Omaha Children’s Museum, 500 South 20th Street, Omaha. The Durham Museum invites you to join in the festivities during Christmas at Union Station. Included with regular museum admission. See the beautiful huge Christmas Tree plus enjoy Family Night with Santa, Holiday Concert Series, and more. Included with regular admission. Location: The Durham Museum, 801 S 10th Street, Omaha. Holiday Poinsettia Show at Lauritzen Gardens – Nov. 23, 2018 – Jan. 6, 2019 (9 a.m. to 5 p.m.). See thousands of poinsettias with model garden trains, miniature Omaha-area landmarks, and a 20-foot-tall poinsettia tree in the center. Included in regular garden admission. Holiday Poinsettia Show Aglow – Special evening hours on select nights. Closed Thanksgiving, Christmas Day and New Year’s Day. Location: Lauritzen Gardens, 100 Bancroft St., Omaha, NE. Enjoy many special Holiday Events at Omaha Public Libraries. Some events require registration as space is limited. Visit omahalibrary.org or call the hosting location for more information and to verify details. Millard Branch: Reed, the library elf, is hiding in the Children’s Area. You’ll get a prize if you find him. He’ll be moving around the library throughout the month. Will Buddy be able to charm his stressed-out dad who long ago lost his seasonal spirit and wants nothing to do with a son he didn’t know he had? This fun-filled musical adaptation of the favorite holiday film that became an instant classic is a stuffed stocking full of song and dance that your family will most definitely want on your Christmas Wish List! Location: The Rose Theater, 2001 Farnam St., Omaha, NE. Kids 3 and up can enjoy a quick project. Sign up in-store or just drop in. $2-$5 per child, supplies included. Free crafts for kids every Saturday. Ages 3 and up. Find many Ongoing Holiday Events here! Enjoy a fun-filled evening of watching The Polar Express. It will be an interactive showing with hot chocolate and cookies, dancing, shaking “I Believe” bells, and more. Location: 14850 Laurel Ave., Omaha, NE. Kids will get to meet real reindeer from Santa’s woods, plus enjoy fun activities and Santa. Location: Fat Brain Toys, 16909 Burke St., Omaha, NE. Santa arrives at 5 p.m., free cookies & hot chocolate, free craft, free photo with Santa 6-8 p.m., and magical tree lighting. Location: Bass Pro Shops, 2901 Bass Pro Dr., Council Bluffs, IA. 5111 N. 90th St., Omaha. Join in for the moment the park transforms into wonderland, and stay awhile to enjoy several family-friendly activities, including all of your favorite traditions – the holiday lights countdown, Santa, reindeer, hot chocolate, plus a few surprises. Location: Bayliss Park, 100 Pearl Street, Council Bluffs. Join in for Milk or OJ and a cookie. Santa will arrive about 11:30, greet the children and read them a story or two. Then, the children will line up and “parade” with Santa up and down the hall before they help him walk through the magic doors to his chair to start the Holiday season! Location: First Level, Von Maur Court area in front of the Santa Set at Westroads Mall, 10000 California Street, Omaha. From 3 – 5 p.m., get a first look at the Miracle on Farnam window displays, enjoy family-friendly activities, including candid photos with Santa and Mrs. Claus, a scavenger hunt and much more! At dusk, see the trees of Turner Park lit in white lights. At 6 p.m., there will be a special Showing of the family holiday movie The Polar Express in Turner Park. Location: 32nd & Farnam, Omaha. Tangier Shrine Feztival of Trees – Nov. 17-24 (hours vary – see the website for details). Admission is $2 per person (kids 12 and under are free). Get in the holiday spirit by walking through a Christmas tree wonderland. Purchase raffle tickets for $1 each to win one of the almost 70 fully decorated trees and the prizes that go with each tree. (Each tree is valued at a minimum of $500!) The trees will be raffled off on Saturday, Nov. 24 for pickup on Sunday, Nov. 25 between 9 a.m. and 1 p.m. Location: 2823 S. 84 St. (just south of 84th and Center). Snowflake Cafe features sandwiches, salads, and desserts, including more than 10,000 homemade sugar cookies. See the Coca-Cola Caravan. Santa, his reindeer, and the Coca-Cola polar bear will be visiting. Location: Hy-Vee, 3410 N. 156th St., Omaha, NE. Find many Ongoing Holiday Events here and Things to Do Over Thanksgiving Weekend here! The day before Thanksgiving- and so much to be thankful for! Let’s share our blessings for 3 organizations: The Nebraska Humane Society: tie fleece blankets; Youth Emergency Services: assemble sandwiches and prepare soup for the homeless and at risk youth of our city; Open Door Mission: decorate lunch sacks for the homeless men, women, and children of our city. Perfect for all ages. This is a free event ~ all supplies provided. Donations will be delivered immediately following the event. Please feel free to bring any donations (food, clothing, etc) for these non-profits. Location: The Wonder Nook Omaha, 10806 Prairie Hills Dr., Omaha, NE. Santa arrives to light the Christmas Tree, favorite storybook and holiday characters, free jingle bells, and more. Location: Shadow Lake Towne Center, 72nd St. & Hwy. 370, Papillion, NE. Come to Shadow Lake Towne Center to enjoy a complimentary carriage ride down Main Street. Loading will be outside of Carhartt. Weather permitting. Starting at 5:40 p.m., enjoy a special performance. At 6 p.m., Mayor Jean Stothert will lead the all-ages crowd in a countdown to the 2018 lighting display, with live fanfare by the Jingle Bell Brass Band. Holiday Lights can then be enjoyed every evening from 5 p.m. until 1 a.m. through January 1, 2019. Followed by free, family-friendly Making Spirits Bright Holiday Concert at 7 p.m. at Holland Performing Arts Center, 12th & Douglas. Location: Gene Leahy Mall, 14th & Farnam, Omaha, NE. Choose & Cut Christmas Trees, Wreaths & Roping, Gift Shop. On the weekends, 9 – 4:30, fun activities (kids crafts, Winter Wonderland, hayrack rides, Santa & live reindeer.) Military & First Responders discount offered only Dec 1-2. Meet and Greet the Gingerbread boy and girl in Center Court from 12 p.m. – 1 p.m. The Grinch and Cindy Lou Who meet and greet will be from 1 p.m. – 2 p.m. Location: Regency Court, 120 Regency Pkwy., Omaha, NE. Tree lighting happens at approximately 7 p.m. Entertainment, cookie decorating, holiday crafts, live music, and more. Included with admission. Location: The Durham Museum, 801 S. 10th St., Omaha, NE. The Peppermint Elves Family Holiday Concert at 6 p.m. followed by a Santa Parade and Tree Lighting at 7 p.m. Free carriage rides are also available. Location: Village Pointe Shopping Center, 17305 Davenport St., Omaha, NE. Location: Aksarben Village, 67th & Center St., Omaha, NE. Assemble a gingerbread picture frame that doubles as a Christmas ornament. Once the picture frame is built, your child can decorate it with paint and holiday stickers. On the center plaza, enjoy free horse-drawn carriage rides with Santa, and free hot chocolate and cookies while you wait. Holiday shoppers can enjoy complimentary horse and carriage rides throughout the center. Weather permitting. Enjoy a variety of activities including carriage rides, bonfire, visits with Santa, popcorn, hot chocolate, photos with live reindeer and more. Santa makes his entrance on a fire truck and will make his way through the downtown area from 3:15 to 4 p.m. He will then visit with children until 6 p.m. in the Downtown Gazebo. Free carriage rides are also available. Santa will begin his route around La Vista at 3 p.m., leaving from the Santa’s Workshop parking lot. He will be west of 84th Street from 3-5 p.m. and east of 84th Street from 5-7 p.m. Click here to view the route. Santa will arrive to turn on the lights outside City Hall at 6 p.m. Then head inside for a soup supper provided by the Mayor and City Council, holiday entertainment from La Vista Middle School, and more! Santa will visit with children at his workshop. Location: City Hall and Community Center, 8116 Park View Blvd. ; Santa’s Workshop, 8305 Park View Blvd., La Vista. Enjoy many special Holiday Events at Omaha Public Libraries. For events marked REGISTER, participating need to register ahead as space is limited. Visit omahalibrary.org or call the hosting location for more information and to verify details. More than 20 local cultural organizations proudly display their crafts and traditional dress, while musicians and dancers perform throughout the evening. Included with regular admission. Sycamore Farms will fall under a captivating spell and magically transform into a Vintage Winter Wonderland. Hours: Friday: 5 – 9 p.m., Saturday: 10 a.m. – 7 p.m., Sunday: 10 a.m. – 5 p.m. Check website to verify before visiting. Location: Sycamore Farms, 1150 River Road Dr., Waterloo, NE. Location: Aksarben Village, 67th & Center St, Omaha. There will be a variety of crafters (and a few Direct Sales reps) ready to show you their creativity. Bath bombs, home decor, yard art, jewelry, dog treats, dog leashes, magnets, wood signs, clothing and so much more. This event is benefiting Little White Dog Rescue. Proceeds from admission and raffle ticket sales go directly to the rescue. Location: Westside Community Conference Center, 3534 S 108th St, Omaha. Stop by and take photos with Santa. Dec. 1, 2018 (10 a.m. – Noon), Maple Bank, 13220 Birch Dr., Omaha, NE. Dec. 8, 2018 (10 a.m. – Noon), West Center Bank, 2545 S. 180th St., Omaha, NE. There will be a life size snow globe that guests can walk into to take a picture! Mutual 1st will donate $1 to Child Saving Institute for each picture posted to Facebook or Instagram using #GlobeOfGiving! Kick-off Event: Join in from 11 a.m. – 1 p.m. on Dec. 1 for the kick-off event, complete with special giveaways for the first 300 people and random prize drawings! Location: Westroads Mall, next to Flagship Commons. Ride with Santa on a special sleigh around the park. Enjoy hot cocoa, write a letter to Santa, explore the trails and other family fun activities. Please bring a new pair of mittens or a non-perishable food item to donate. Must RSVP online at parks.cityofomaha.org under “Activity Registration” button. Location: 3033 Hummel Park Rd., Omaha, NE. Location: Scheels at Village Pointe, 17202 Davenport St., Omaha, NE. Santa Claus and Star Wars (the Imperial Stormtroopers of the 501st Legion) join forces for a fun-filled family day. 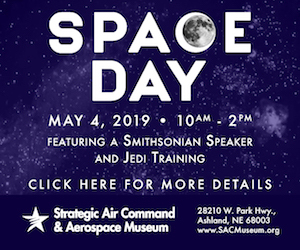 Young guests will have the opportunity to visit with Santa and experience Space Day. Space-related booths, pictures with Santa and Star Wars Characters, activities, make-and-take ornament, and holiday music are part of the day. Event is included in the price of admission and pre-registration is not necessary. Location: Strategic Air Command & Aerospace Museum, 28210 W. Park Hwy., Ashland, NE. Santa will be visiting the library and community center. Enjoy story time, crafts and lots of activities! Greek food, pastries, music, dancing, St. Nicholas, and more. Location: St. John the Baptist Greek Orthodox Church, 602 Park Ave., Omaha, NE. Come to 24th and Lake and celebrate the season in an awesome and amazing way! The event features fun and informative art demonstrations, with residents of the Hot Shops opening their studios to the public. Local acoustic musicians will perform throughout the center. Location: Hot Shops Art Center is located at 1301 Nicholas St., just one block north of TD Ameritrade Park’s home plate. Visit live reindeer in Center Court. North Omaha Lighting Ceremony will be held near 24th & Lake Streets (in Dreamland Park) at 4:30 p.m. on Saturday, December 1, to close out Christmas in the Village. Holiday lights will enhance the six-block surrounding area. South Omaha Lighting Ceremony will be held at 4911 S. 24th Street (24th & N St.) also on Saturday, December 1 at 5:30 p.m. Lights will shine brightly along 24th Street between L and Q Streets. Fontenelle Forest is lighting one of their trails with thousands of holiday lights for visitors to get a truly awe-inspiring experience this time of year. Enjoy the Forest after hours to see the holiday lights in their full glow. Hike down the boardwalk where children can meet Santa in the woods and create a lasting holiday memory. Enjoy s’mores and cocoa by the fire pits on the plaza. Location: Fontenelle Forest, 1111 Bellevue Blvd N, Bellevue, NE. WEATHER UPDATE: Due to inclement weather, there will be no trolley service between venues and no activities at the YMCA. 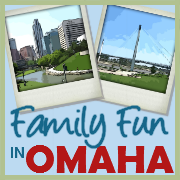 Enjoy family activities and experience many of Omaha’s leading downtown attractions for FREE including Omaha Children’s Museum, The Durham Museum, Downtown YMCA, Omaha Police Mounted Patrol Barn, W. Dale Clark Library, and Joslyn Art Museum. A free trolley service will connect the participating venues. The evening will feature Santa and his elves, live Christmas music, Christmas crafts, hot dogs, chili, cookies, and hot cocoa all for free. Location: Main St. in Olde Towne Elkhorn, with the lighting of the Elkhorn Christmas Tree at 5 p.m. Enjoy a variety of fun events throughout the Holiday season! Dec. 3, 2018 (9 a.m. – 12 p.m.) – Santa is hosting a special time for small children (birth to preschool) to join him at his workshop! Santa is making a special stop to visit all the little girls and boys. Location: A.V. Sorensen Community Center, 4808 Cass St., Omaha, NE. Santa and his reindeer visit the museum the first three Tuesday nights in December leading up to Christmas. Families can also take part in creating holiday crafts at the David M. Mangelsen’s Craft Corner and enjoy live performances by local choirs and ensembles. NEW THIS YEAR – Grab the family and climb into our antique sled for a memorable photo opportunity! Included with regular admission. Special storytime in Santa’s Workshop. Mrs. Claus Storytime will take place at 10 a.m. on Dec. 6th, 13th and 20th across from Ann Taylor. Enjoy Christmas stories, watch the snowfall in center court and take a picture with Mrs. Claus. Location: Regency Court, 120 Regency Pkwy., Omaha. Santa will read a holiday story to kids on Tuesdays in December at 10:30 a.m. at various Village Pointe stores. Treats and/or giveaways will be provided for children attending. The December Family Date Night is a tasty night of cookie decorating and special evening showtimes of Santa’s Magic. 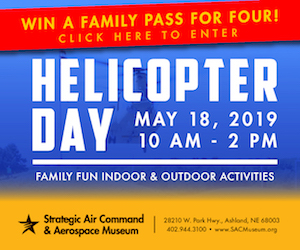 All activities are included with museum admission (while supplies last). Location: 500 S. 20th St., Omaha, NE. This is a free, family-friendly event featuring live reindeer inside a heated tent. Santa and his elves will be location for photo opportunities. Location: Bel Air Plaza Parking Lot, 12100 West Center Road, Omaha. Christmas celebration featuring pictures with Santa, sugar cookie decorating, crafts, greeting cards for veterans and free hayrack rides through the park. Visitors will need a daily or annual Nebraska State Park permit. Celebrate the magic of Christmas with Broadway singers and tap-dancing Santas performing Christmas classics and contemporary favorites. Ballet Nebraska’s The Nutcracker returns with the visual splendor and charming story that make it a family favorite. Enjoy a lively telling of the poem “A Visit from St. Nicholas,” sing holiday songs, and visit with Santa. Plus, enjoy snacks and make ornaments and gifts. Location: Florence Community Center, 2920 Bondesson St., Omaha, NE. Meet Anna, Elsa and Olaf from Frozen in Center Court. Bring your camera for pictures. During this one-hour class, earn your elf hats, make ornaments, write a letter to Santa, and have a snack! Students will also take home a book about elves to share with family and friends! Tickets are $15 per child, $25 for a pair of siblings-one book. Suitable for ages 3-7. RSVP by emailing Tina at create@thewondernook.com. Location: 10806 Prairie Hills Dr., Omaha, NE. Christmas Movie and Holiday Fun: Tots will love seeing Santa’s Workshop before he makes his big debut to Shadow Lake Towne Center. Location: Located next door to Dream Dress Express at Shadow Lake Towne Center, 7775 Olson Drive, Papillion, NE. Come for breakfast with Santa. They will have a knee-high Kids Buffet for $3.99. Santa will also be walking around to visit with kids. Join the AIM Brain Exchange and Mutual of Omaha for a Winter-themed STEM open house. Bring your family down for a day of winter memories. Activities include: Make an LED holiday card, Program DASH the Robot to have a snowball fight, Program a winter scene using processing.JS. Location: AIM Brain Exchange, 1902 Howard Street, Omaha, NE. Free throw contest for children and their parent/guardian to compete together as a team. A favorite holiday classic comes to life in the all-new touring production Rudolph the Red-Nosed Reindeer: The Musical. Location: Orpheum Theater, 12th St. & Douglas St., Omaha, NE. Meet Rudolph, Frosty and Elf in Center Court. Bring your camera for pictures. Black Business Expo with over 40 locally owned businesses. Entry is free and pics with Santa are $2. Santa will be giving away gifts to the first 100 children. Location: Hope Skate, 2200 N 24th St. Omaha. Meet Beauty and the Beast in Center Court. Bring your camera for pictures. Come visit Santa and have some cookies and a special treat while you play. Cost is $10 per child for non annual membership holders and $5 per child for annual membership holders. 2 and under free with paid sibling. Location: 4223 S. 120th St., Omaha, NE. 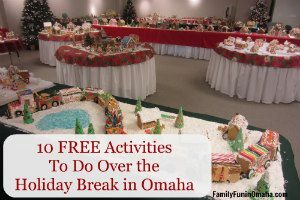 Have a fun-filled Winter Break in Omaha with these 10+ Free or inexpensive activities! Location: Gene Leahy Mall, 14th and Farnam. Find 12 Family-Friendly New Year’s Events! It is always a good idea to verify the information with the business before visiting.